Aamir Khan, Kiran Rao and Azad are giving us major family goals and how. Well, for those who don’t know, we are referring to the latest series of pictures posted by Aamir Khan on social media and we must tell you that the cute can’t even begin to describe them. BTW, did we tell you that Aamir, Kiran and Azad can be seen dressed up as the characters of the famous French comics Asterix. Yes! You read that right. 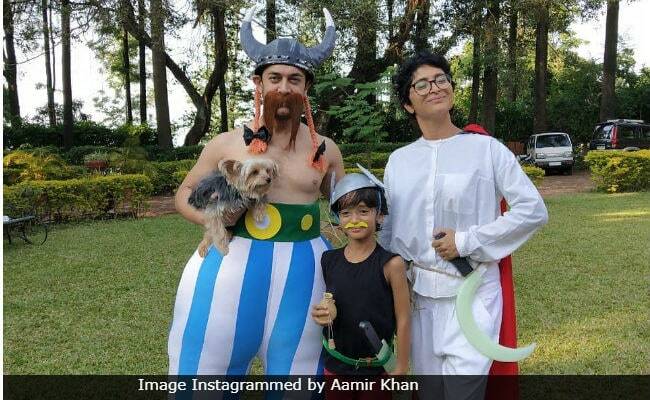 Aamir Khan and Kiran Rao managed to take some time of their busy schedules and decided to dress up as Obelix and Getafix, respectively, while Azad made for a super cute Asterix. However, it will be difficult to say if it we liked Aamir and Kiran’s OTT costumes more or Azad’s cute expressions. Needless to say, Aamir’s Instafam loved the picture and the 62,000 likes on the picture prove that.